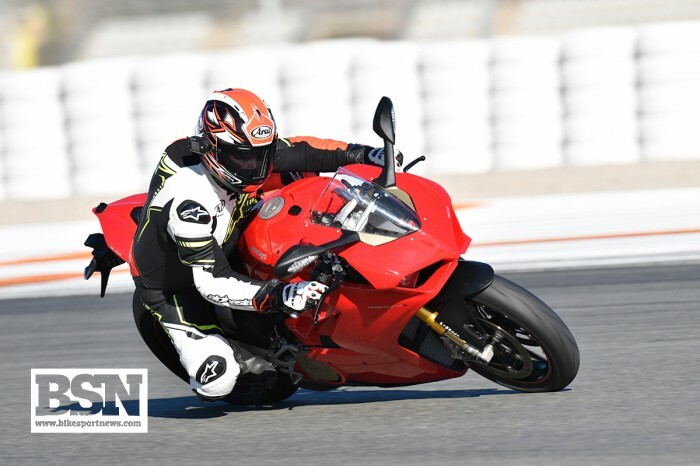 A MotoGP track, a brand new Ducati superbike, and all day to have a blast on it. The perfect recipe for a Bikesport News story right? Well yes – in terms of new bikes, the Panigale V4 launch at Valencia is about as important a story as we’ll have in 2018. But in terms of race news, it’s a bit of a strange one. 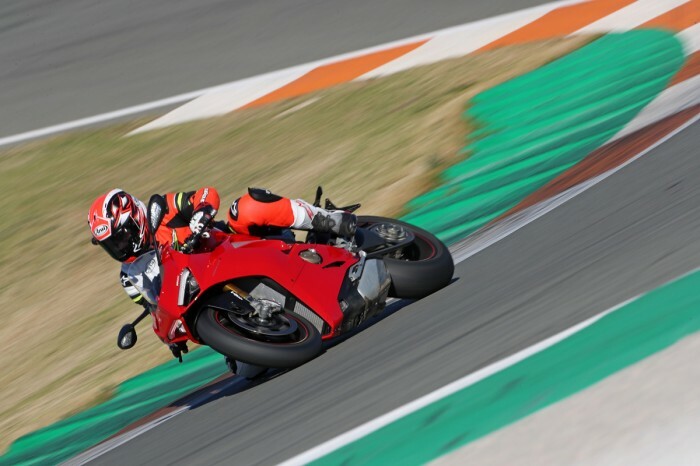 Because while this new Panigale ticks absolutely all of the superbike boxes in terms of power, chassis tech, styling and electronic aids, it falls down on one pretty vital area – it’s an 1,103cc V-four, and so it’s, you know, sort of ineligible for superbike racing? This is less weird than it seems actually. Ducati is working on a 999cc version of this bike for racing, and will release it later this year for a 2019 campaign. In the meantime, the bike it’ll be selling by the boatload round the world will offer a totally different balance of performance compared with the competition, by dint of having ten per cent more engine capacity. At the pre-ride presentation, Ducati engineers gave us a pretty reasonable explanation. They wanted to keep the hammerblow torque which made their big twin Panigales such weapons, and has become the Bolognan trademark. They could no doubt have done this with a 999cc motor – but it would have been down on peak power compared with a screamer. Compare the Yamaha R1 with the Kawasaki ZX-10R as an example: the crossplane big bang R1 feels much mightier than the Ninja low-down, but when you get into the top end of the rev range, the Yam gets a bit breathless. So, by ‘cheating’, and adding on 104cc to the swept volume, Ducati gets the best of both worlds – a little like Kawasaki did with its ZX-636R back in 2002, and Triumph did with the Daytona 650 a few years later. Warmup over, and we’re back out again for a proper go. From the cockpit, the new Pani impresses – a new colour dash is clearer and easier to use than ever, the riding position isn’t too extreme, and the mirrors even seem decent. My stumpy legs are just about long enough to get a tiptoe down each side, and the only faff is reaching the sidestand to flip it up. We’re off again, and the V4 yowls its way out of pit lane like a scalded cat with a sort throat. After the start finish straight, you’re sticking to 2nd and 3rd gear for the rest of the track, pretty much, which simplifies proceedings, and you can get on with enjoying the stonking motor. That unique sound comes from the ‘almost two 360° parallel twins’ layout that Ducati dubs Twin Pulse. The crank offset is 70 degrees, so the front and back pairs fire quite closely together, giving a sound that evokes, but isn’t quite a Yamaha crossplane R1, or a 1299 Panigale. It certainly isn’t a high-revving screamer inline-four either of course, in sound or character. The fuelling is spot-on, and the throttle response is just the right side of crazy – you get lots of nice progressive feel, but smack it open carelessly and it smacks back. There’s stacks of grunt to pull you round the tighter sections of Valencia, hooking between second and third for the short straights then down again, before hitting the long, long left hander that takes you back round to the main straight. That last bend is the sort of corner which, a decade ago, was just itching to highside litre bikes off into the stratosphere, as incautious riders dialled in too much torque, overwhelming 2005-era rubber with no traction control safety net. Now, though, we’ve got a brand-new spec of Pirelli Super Corsa SP, which has a novel 200/60 rear profile, and a host of carcass and compound tweaks to optimise grip. That means much further to go, and a lot more warning before the back end lets go. But we’ve also got the very latest in Bosch traction control looking after us too. This setup offers more protection than ever before for the novice, while giving expert riders a number of choices in terms of allowing more slide from the rear, while still controlling the end result. We’re on the conservative settings to start with – this gives lots of protection, but you can easily dial in more enthusiastic levels of slide potential. Out of that corner and onto the straight, and now the V4 really shows what it can do. Ferocious acceleration, with the head shaking about as you pass pitlane entry, then up into third, fourth and fifth for a moment, then slam on the incredible Brembo Stylema brakes and down into third for turn one. Intoxicating stuff. Next session, I’m paying a bit more attention to the chassis. And the mystery of Valencia as the location becomes clearer too. 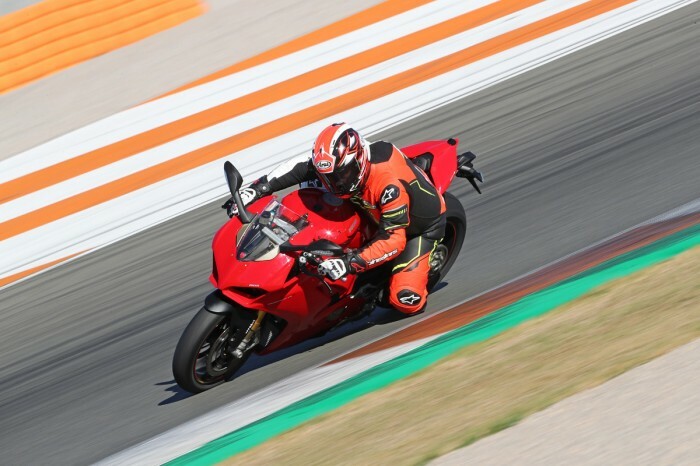 Ducati’s worked real hard to make this missile of a bike easy to control – cutting weight, lengthening the swingarm, developing the front frame section and perfecting the weight balance front and rear. And the results are beguiling. It’s far closer to a middleweight in terms of agility and nimbleness than you’d expect from an 1100cc four. In fact, if it wasn’t from the aches in my shoulders, neck, back and legs, I could have been riding a 600 round here. Because while the V4 makes it easy to go fast, you’re actually working far harder than you think. Just holding on against the thrust out of corners saps your strength, and although you can position the bike on track with little apparent effort, you keep pushing harder and harder to find a limit. I survive till lunch, just about, and then perk up nicely for the final sessions. Partly down to plenty of strong Italian coffee and a nice plate of Ducati hospitality pasta, partly down to the tricked-up V4 I get a ride on in the afternoon. They’re brought along an accessorised bike, with the £3,558 (+VAT) titanium Akrapovic race exhaust fitted. That adds 12bhp and save 7kg, while also bringing a soundtrack fit for a warzone. Not content with this nonsense, the techs spoon on a set of Pirelli SC1 Superbike slicks, a double bubble screen and a few other tidbits. The day’s over now, and we’re waiting for the coach to take us back to the city. I’ve had an amazing experience with this new bike – and I’ve definitely got the impression that Ducati has come up with something amazing. The strategy of bumping up the engine’s capacity past its peers, while working so hard on the handling has made for a unique, incredible performer.